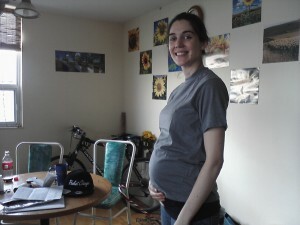 I am sick, and this is by far the schleppiest I have felt for a bump picture. But I am not vain enough to dress up just for a picture, and I wouldn’t want to falsely glamorize pregnancy lest my 16 year old readers think its all fun and games. No young ones, sometimes it’s schleppy and stuffed up and achy, and the futon is the only place you can fall asleep, next to a Walmart bag filled with used Kleenex, and you alternate sleeping in the shirt you wore all day with wearing the shirt you slept in. Saves laundry. On the bright side, I am off work anyways so I don’t have to play the am-I-too-sick-to-work-or-should-I-tough-it-out game every day. I hate that game. Also, the Truck is getting strong! Sometimes this is fun because we can sit around and watch my belly lurch and shudder as the Truck flails around, and every once in a while a limb projects out of my side which is alarming and thrilling all at once. Other times it is not quite as fun because the Truck hammers my ribs and there’s nothing to see, it just hurts. It’s cool though because the last few days I’ve started to notice feeling movement and pressure in my belly even when I’m walking around, and that’s new. It’s still hard to believe that it’s a little person making all this fuss, and that I’m going to meet him/her in a couple months and that they’ll be part of our family forever. And instead of kicking me in the ribs all day, this baby will be spitting up and filling diapers and making noises and all kinds of nonsense that I can’t comprehend.